Napa blue grass is a California endangered plant species, which means that killing or possessing the plant is prohibited by the California Endangered Species Act (CESA). Napa blue grass is also listed as endangered under the federal Endangered Species Act. Napa blue grass is a perennial bunch grass that is found in wet areas that are next to and fed by hot springs and geysers, and the species is currently only found at two sites on private property near the City of Calistoga in Napa County, California. Napa blue grass co-occurs with the California threatened Calistoga popcorn-flower (Plagiobothrys strictus). Cooperation with private landowners is essential for the protection and reduction of threats to Napa blue grass populations. Additionally, Napa blue grass seeds should be collected and properly stored by qualified institutions to guard against extirpation, and populations of the species should be adequately surveyed and monitored. CDFW may issue permits for Napa blue grass pursuant to CESA, and you can learn more about the California laws protecting Napa blue grass and other California native plants. 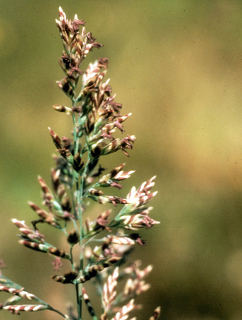 Populations of Napa blue grass occur in CDFW’s Bay Delta Region. More information is also available from the U.S. Fish and Wildlife Service Species Profile for Napa blue grass.